MARTIAL ART. Adulthood is the widest and most variyng season of life, characterized by very different phases. Yet, the practice of traditional Wado-ryu karate is ideal for each of them. Wado-ryu is a complete martial art that fosters an ideal psycho-physical shape in people of all kinds, ages and conditions. EFFECTIVENESS. Wado increases joint mobility, flexibility and muscle reactivity, improving reaction times and practically all the human skills. Our lessons are conducted traditionally, but according to the modern training science, and are focused on the effectiveness of the karate techniques and on the development of a profound self-mastery. MIND AND BODY. 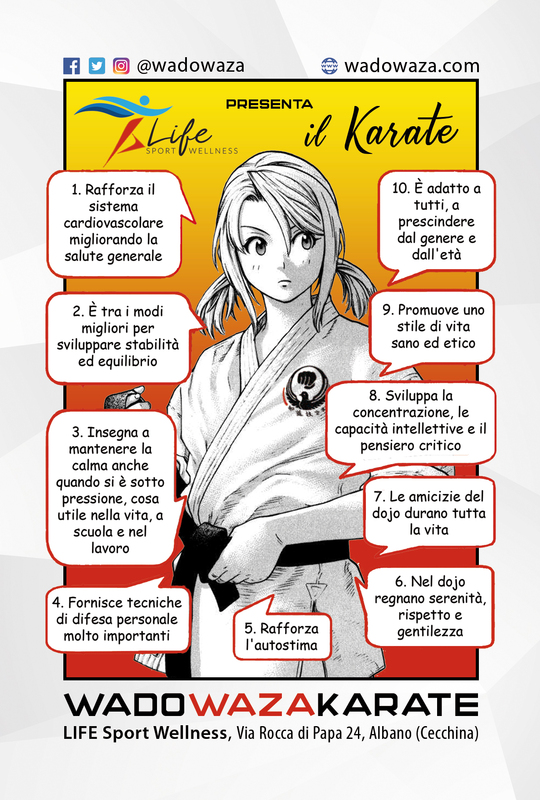 Traditional karate is also an effective brain training, for the benefit of attention, very useful in daily life (such as, for example, when driving). In addition, training barefoot activates the plantar pump, to the benefit of the cardiovascular system, and the natural approach to postures actually offers similar results to postural gymnastics. SELF DEFENCE. Wado-ryu comes from the encounter of the original karate with jujutsu, therefore it is an effective personal defence system. Karate was a combat system developed by the Okinawan fighters, while the Japanese jujustu has been for centuries the martial art at the base of the samurai warriors training.